If I can have a note regarding your measurements, it will be very helpful to make a right size or custom size for you. If you don't know the Bust, Weight, Hips, DON'T WORRY! You can just leave me your hight and weight. If you have any questions when you receive my items. Please don't hesitate to contact me, I accept exchange or return if items are unwashed and undamaged. "Leave your choices in the "Note To Seller" section during checkout! *washed, and will get softer with use. *making time 1 week, Handmade, quality items take time, so please allow approx.1 week for your order to be made.Thanks so much for your patience. her measurements are: Bust: 31" Waist: 23 Hips: 33"
Bust: 32-33" Waist: 24-25" Hips: 33.5-35"
Bust: 33-34" Waist: 26-27" Hips: 36-38"
Bust: 37-41" Waist: 32-34" Hips:41-44"
Bust: 42-44" Waist: 34-37" Hips: 45-47"
-We recommend washing the garment inside out to ensure a long-lasting, fresh look. -Wash in cold with like colors. -Hang dry (preferred) or tumble dry/low. -Dry or hang dry, I like to hang dry and iron inside out, if you iron on the transfer it will adhere to your iron, so please don't. Thanks! -For longer longevity of the items, please gently . In order to prevent clothes from fading, dark color clothes (especially red and dark purple) should pre-wash and separate from light color clothes. Feel free to convo me with any questions! 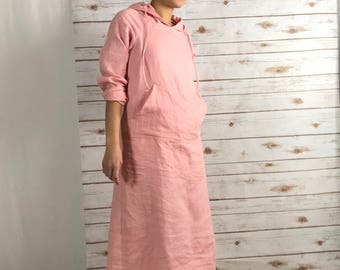 Linen Dress/ All season dress/Washed/ Textured/100% LINEN/LINEN dress/long tunic/long top/#LD1704/Length: 34.5"
NEW! 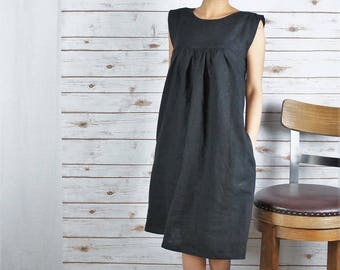 !Linen Dress/ All season dress/Washed/ Textured/100% LINEN/LINEN dress/long tunic/long top/#LD1802/Length: 34.5"
V-neck Linen Dress/ Shift dress/All season dress/Washed/ Textured/100% LINEN/LINEN dress/long tunic/long top/#LDV1707/ 36"
Linen DRESS/ All season dress/Washed/ Textured/100% Linen/LINEN dress/long tunic/#LD1801/Length: 38.5"
Really lovely and fits perfectly to the measurements I sent. The modification I requested was done spotlessly. 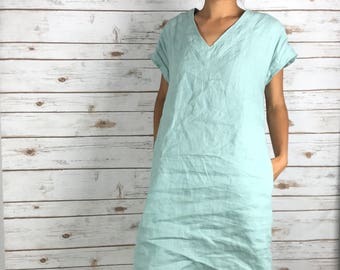 Sehr schön verarbeitetes Kleid aus qualitativ hochstehnedem Material (Leinen). Bestellte Länge stimmt und die Lieferung wart termingerecht. - PayPal. You may pay via PayPal with your credit card without having a PayPal account. Please contact me when you have problem with the item you bought and I will always provide a solution for you. Every pieces are made by order with a lot of care and attention especially for you, so please keep in mind that we cannot make a refund or exchange for custom ordered items such as custom length / custom color/ custom design - unless the product is faulty or damaged, or wrong size. If for any reason you are unsatisfied with our products such as TEA TOWELS, BATH TOWELS, SCARFS, APRONS, READY TO SHIP ITEMS - you can return them for an exchange or full refund. You will be entitle to get a refund or exchange of the product if you request one in writing within 3 days of receipt. All items must be returned unused and in a saleable condition. We will make a refund of purchase to your account once we receive the return. Original shipping charges and duties are not refundable. Your parcel is your responsibility until it reaches us. Unfortunately, we can't accept liability for products that get lost or damaged in return transit. Please don't wash the items if you'd like to exchange or return. Washed items won't be accepted for exchange or return. If an item is lost or damaged during shipment we are not responsible, but will work with you to rectify the problem. ***Please allow up to 2-3 Weeks for your item to Ship. (Not including shipping time). If you need something shipped out immediately let me know and I will do what I can to get it to you even faster! Most orders are shipped by USPS (3-5 shipping days in the U.S.), unless otherwise requested. Custom orders take about 3-4 weeks (from the time that I receive payment) to have made and shipped out. Convo me if you want to upgrade your shipping, if you would like insurance, delivery confirmation (US only), express overnight etc and I will change your shipping cost accordingly.International orders might take longer shipping time depends on the destination, so if you need your item in rush, please let me know. I will open a custom listing for you and ship it using faster shipping methods for additional shipping cost. I complete all orders in the order/date as they were placed. Thank you for your understanding and patience! It might occasionally be delayed by customs procedure or bad weather. Shipping cost is the total price of shipping materials, handling and shipping fees. I can not be responsible for any delays of mail services,but I always try to support my buyers with additional information to make situation clear. I will ship the orders to your Etsy address, pls make sure it is correct. I won't be responsible for wrong shipping addresses due to your typing errors. Please do not compare my products with other sellers who provide factory-made clothing by operating the network sale with low process and shipping cost. Most of pieces are made by order with a lot of care and attention especially for you , so please allow approx. 2-3 weeks for your order to be sewn. Although for some smaller items it might be quicker. Many thanks for your patience. All garments I make in custom length. But please keep in mind, that the length you provided is approx.length, and it can variate +-1inch. Every part of process (making pattern, cutting, sewing..) is done by hand, not made in factory. Thanks for your understanding. -I recommend washing the garment inside out to ensure a long-lasting, fresh look. -gentle washing machine cycle, It is best to wash NATURAL FABRIC products in lukewarm or cold water (saves energy too). Wash it with a mild soaps. -Use WARM, steam iron if needed. Do not use: tumble-dryer, bleaching, dry cleaning. It would be greatly appreciated if you can rate my shop 5 stars. If the products do not meet your requirement, please let me know. I will resolve the problem as soon as possible. Thank you for all your respect for my design and labor! 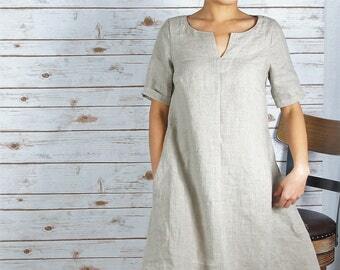 Linen Tunic/ dress/Washed/ Textured/100% LINEN/LINEN dress/long tunic/lond sleeves/42.5"